After rebounding from upper target levels, Eurodollar started falling down. First target for bears is at level of 50%: if they break it, market will continue falling down towards level of 61.8%. I’m selling, but very carefully, because this descending movement may turn out to be just another correction. As we can see at H1 chart, price reached its target levels right inside temporary fibo-zone. There are several additional fibo-levels close to level of 50%. Possibly, price may reach new minimum during the day. Franc tested lower fibo-levels one more time and rebounded from them again. Closest target for bulls is at level of 50%: if price breaks it, pair will continue growing up. 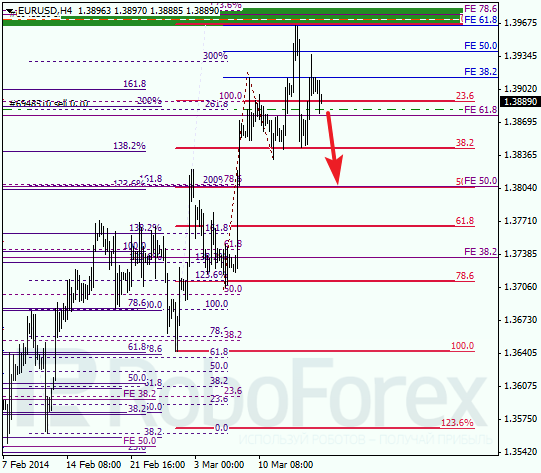 At H1 chart we can see, price reached lower targets right inside temporary fibo-zone. In the near term, pair is expected to grow up and reach at least level of 0.8810, where there are several fibo-levels.